The New York Giants have a rich football history dating back to 1925 that includes 31 playoff appearances and four Super Bowl championships. Fans and the team hope that this continues as the Giants started a new chapter in their history at MetLife Stadium in 2010. In September 2005, both the Giants and Jets announced that they had reached an agreement to build a new stadium in the Meadowlands. 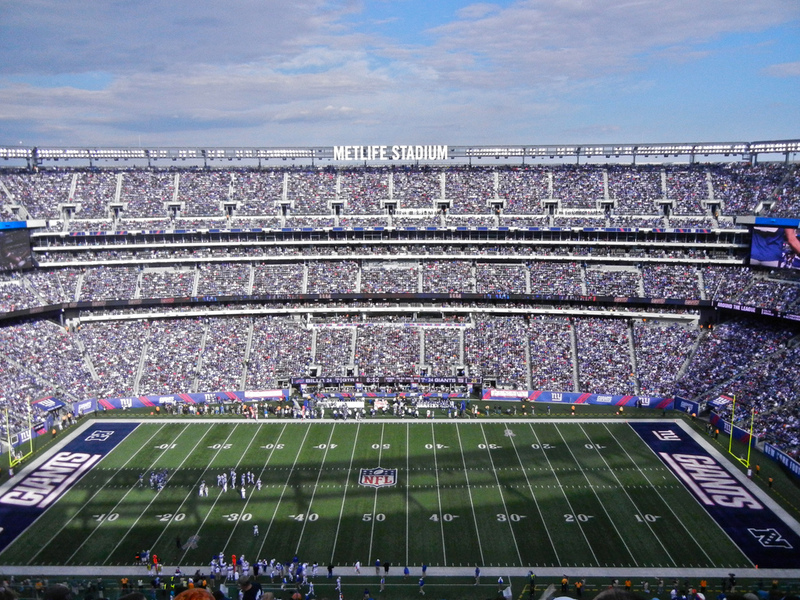 For nearly five years, both teams had been exploring options of having separate stadiums built, the Jets on Manhattan’s west side, and the Giants in New Jersey. After the Jets failed to get a new stadium built in Manhattan, they decided to team up with the Giants to build a new stadium adjacent to Giants Stadium. In September 2007, renderings and details of the new Meadowlands stadium were released. Although site work begin in April 2007, official groundbreaking was held on September 5, 2007. The has a seating capacity of 82,500 in four levels that enclose the stadium. This includes 9,200 club seats and 117 luxury suites. Fans sitting in the front row along the 50 yard line seats are the closest to the action in the NFL at 46 feet away. It features two club areas, the Coach’s Club and the mezzanine level clubs. The Coach’s Club features a 20,000 square foot bar and lounge on the field deck just five yards from the team’s bench. On the mezzanine level are the east and west side clubs where fans can enjoy a climate controlled atmosphere and a variety of food and beverages. Fans can see replays from the gridiron on four 40′ x 130′ video/scoreboards that are located in each corner below the upper deck. Defensive Player of the Year Lawrence Taylor in 1981, ’82, ’86. Since the stadium is the home of two teams, individualization is an important concept of the stadium. Interior illumination of colors switch depending on the home team. Outside, giant red pylons at the North and East entrances will show videos of whatever team is playing at the facility. The signature feature at the stadium is the Great Wall. In the shape of a rectangle, this 400′ x 40′ high wall shows murals of players and team moments outside the stadium. Both the Jets and Giants are committed to staying in New Jersey for the next 99 years. This is the first time two teams have come together 50/50 in a partnership to build a new stadium. 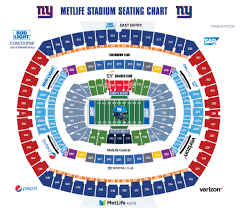 Known for its first season as Meadowlands Stadium, the naming rights were purchased by MetLife in August 2011 for 25 years at a cost of $17 to $20 million. The New York Giants played their first game at MetLife Stadium on September 12, 2010, winning against the Carolina Panthers. 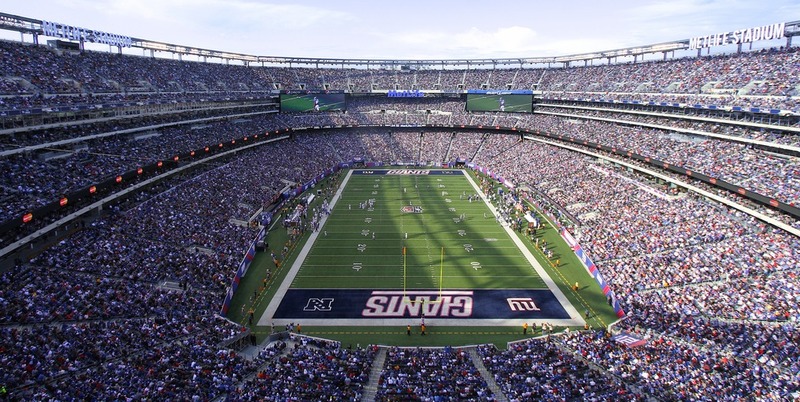 Although MetLife Stadium is primarily the home of the Giants and Jets it is home to many other events, including the Super Bowl in 2014. It marked the first time the Super Bowl was played at an outdoor stadium in a cold-weather climate.